Sodium Bisulfate Poisoning is the accidental or intentional intake of products containing sodium bisulfate. What is Sodium Bisulfate Poisoning? What are the Causes of Sodium Bisulfate Poisoning? What are the Signs and Symptoms of Sodium Bisulfate Poisoning? How is First Aid administered for Sodium Bisulfate Poisoning? Who should administer First Aid for Sodium Bisulfate Poisoning? 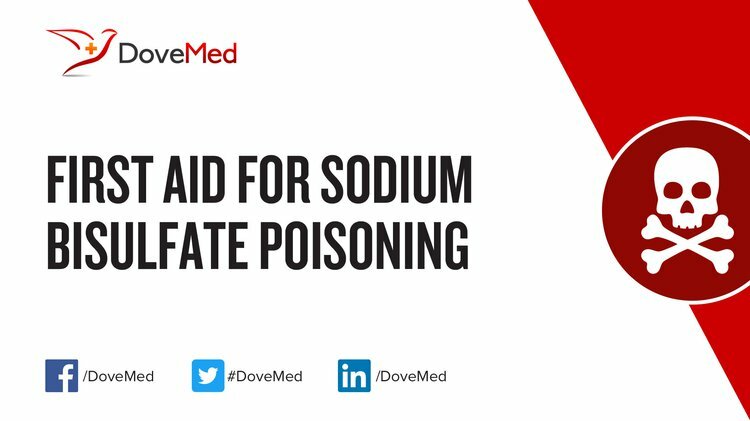 First aid for Sodium Bisulfate Poisoning is administered by healthcare professionals. What is the Prognosis of Sodium Bisulfate Poisoning? How can Sodium Bisulfate Poisoning be Prevented? Moussot, P. E., Marhar, F., Minville, V., Vallé, B., Dehours, E., Bounes, V., & Ducassé, J. L. (2011). Use of intravenous lipid 20% emulsion for the treatment of a voluntary intoxication of flecainide with refractory shock. Clinical Toxicology, 49(6), 514-514. Jaiswal, A. K., & Mali, B. U. (2014). Differential Pulse Cathodic Stripping Voltammetric Determination of Trace Level of Arsenic in Blood and Urine of A Poisoned Patient: A Case Study. Indian Journal of Forensic Medicine and Pathology, 7(4), 153. Dänicke, S., Hegewald, A. K., Kahlert, S., Kluess, J., Rothkötter, H. J., Breves, G., & Döll, S. (2010). Studies on the toxicity of deoxynivalenol (DON), sodium metabisulfite, DON-sulfonate (DONS) and de-epoxy-DON for porcine peripheral blood mononuclear cells and the Intestinal Porcine Epithelial Cell lines IPEC-1 and IPEC-J2, and on effects of DON and DONS on piglets. Food and Chemical Toxicology, 48(8), 2154-2162. Du, X., Yang, G., Chen, Y., Ran, J., & Zhang, L. (2017). The different poisoning behaviors of various alkali metal containing compounds on SCR catalyst. Applied Surface Science, 392, 162-168. Meng, W. J., Li, Y., & Zhou, Z. G. (2012). Anaphylactic shock and lethal anaphylaxis caused by compound amino acid solution, a nutritional treatment widely used in China. Amino acids, 42(6), 2501-2505. Firouzkouhi, M., Zargham-Boroujeni, A., Nouraei, M., Yousefi, H., & Holmes, C. A. (2013). Nurses experiences in chemical emergency departments: Iran–Iraq war, 1980–1988. International emergency nursing, 21(2), 123-128. Nurulain, S. M. (2012). Different approaches to acute organophosphorus poison treatment. JPMA-Journal of the Pakistan Medical Association, 62(7), 712. Darandale, S. N., Sangshetti, J. N., & Shinde, D. B. (2012). Ultrasound mediated, sodium bisulfite catalyzed, solvent free synthesis of 6-amino-3-methyl-4-substitued-2, 4-dihydropyrano [2, 3-c] pyrazole-5-carbonitrile. Journal of the Korean Chemical Society, 56(3), 328-333.